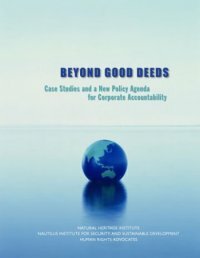 California Global Corporate Accountability Project (CAP) is a collaboration between the Nautilus Institute for Security and Sustainable Development, the Natural Heritage Institute, and Human Rights Advocates. The project seeks to identify the human rights and environmental governance dilemma faced by US corporations in their global operations, and to enhance corporate social and environmental performance. The Project focuses on sectors and corporations with a high degree of business activity in California, initially focusing on the oil and high tech sectors. The official CAP website, containing other materials generated by the project, is here.